dripping from the leaf tips above. More kinds of plants and animals live in rain forests than anywhere else on earth. Rain forests have existed for millions of years, but face new challenges. Explore the incredible variety and delicate balance of life in the largest rain forest in the world, the Amazon, as well as the rain forests in different parts of the world, including some in our own backyards. My interest in rain forests was enlivened early, when at age four I sat surrounded by tropical vegetation, palm trees and alligators. After that I read books about rain forests, some scientific accounts, others adventures. When I was grown I traveled to temperate rain forests on the West Coast of North America first, encountered trees so large that ten people with their arms outstretched could not surround the tree trunks, then went to tropical rain forests in Central and South America, Australia and Asia. In each, there were plenty of discoveries to be made, peering from the forest floor through tangled vines of the understory to the treetop canopies. With the immense variety of life in rain forests, there is an incredible amount to learn. 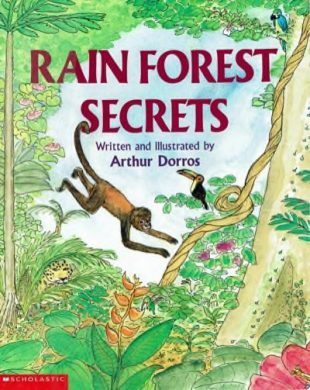 In doing the research for this book I soon found for example, that for every kind of tropical rain forest plant science now knows there are perhaps ten more that are unknown. I once met someone who had been lost alone in the Amazon rain forest for a month. What had he eaten? I asked him. “Fruits,” he told me. I thought of mangos and other tropical fruits I knew, but he said no, in the entire month he did not eat a fruit he recognized. He tested the fruit as carefully as he could, and at night swept away spiders as big as his fist in the moonlight. There were things to be concerned about in the forest, as there is reason to be concerned about the survival of the forests themselves. But his smile stretched from ear to ear when he described surviving his explorations. On my trip at age four, I was standing on a pile of rocks among the palm trees, when a skinny old man angrily yelled at me: “Get off that pile of rocks!” I couldn’t figure out what I might be doing wrong. Then he added: “There are poisonous snakes in there!” Thank you for telling me. I jumped off the pile of rocks and snakes and hit the field running while his yell still hung in the air. He continued to glare at me. It was hard to be grateful to a grouchy old guy, but I was. Sometimes it’s important to be grateful to grouchy old guys. Thirty-five years later, when I went to a rain forest research station in a lush Costa Rican forest to prepare for RAIN FOREST SECRETS, snakes still hung in my mind if not on the vines and branches around me. The first day I arrived, an older researcher warned me that this was the rainy season and it would likely rain hard that afternoon, and every afternoon, for a couple of hours. I walked gingerly along the trails and looked nervously at anything long, slender, and potentially wriggling. I saw lizards scurry along the trail, but no snakes. I saw leaves walking down tree trunks and on closer examination found that they were bits of leaves being carried by leaf-cutting ants to their underground gardens. I heard rustling in the tree branches overhead and spotted a troupe of spider monkeys swinging, dangling, and leaping. Soon though, there was a louder rustle throughout the treetops. Wind was picking up, gusting and bringing in dark, dark rain clouds. It turned out the daily rain, really a rainstorm. I heard cracking as branches bent further and further. One fell nearby, so covered with plants that it was elephant heavy and shattered into chunks of greens and yellows as it thudded close to me, an entire treetop garden-epiphytes, bromeliads, brilliant orchids. When the rain subsided, the forest was still full of the drumbeats of water dripping from leaf to leaf for hours. I continued to explore, with all senses as alert as possible. Now in the Pacific Northwest, in the temperate rain forests that remain, I see bobcats, eagles, elk, all kinds of animals, and in the patches of ancient forest-giant trees thousands of years old-older and larger than tropical rain forest trees. I am always excited by the possibilities of what is to be found in the fantastic richness of rain forests.